This article is about the card. For the archetype, see "Code Talker" (archetype). The English and German names given are not official. Gains 500 ATK for each monster it points to. 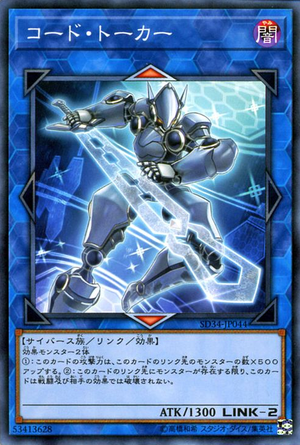 Cannot be destroyed by battle or your opponent's card effects, while it points to a monster. ① : 이 카드의 공격력은, 이 카드의 링크 앞의 몬스터의 수 x 500 올린다. ② : 이 카드의 링크 앞에 몬스터가 존재하는 한, 이 카드는 전투 및 상대 효과로는 파괴되지 않는다. This page was last edited on 22 December 2018, at 03:29.